A key Quality parameter during printing is colour. The best solution is being able to: • Show your customer in one graph that the printed colour is in tolerance over time; • Provide feedback to the operator if the colour printed is in tolerance. Press Manager Foundation makes this all possible the better way. In combination with ICCSforPMF it is also possible to manage the ink formulations used to print the colour. TC and Partners developed a procedure and tool for importing articles and colour codes from any ERP system to help you with the fast and easy introduction of PressManagerFoundation (Colour QA). This save time creating articles in PMF and allows a fast implementation of Colour QA. A complete program suite (PMF and ICCSforPM) is available providing the most efficient way to communicate colour data and ink formulation data with your Ink supplier and optional ink dispense system. 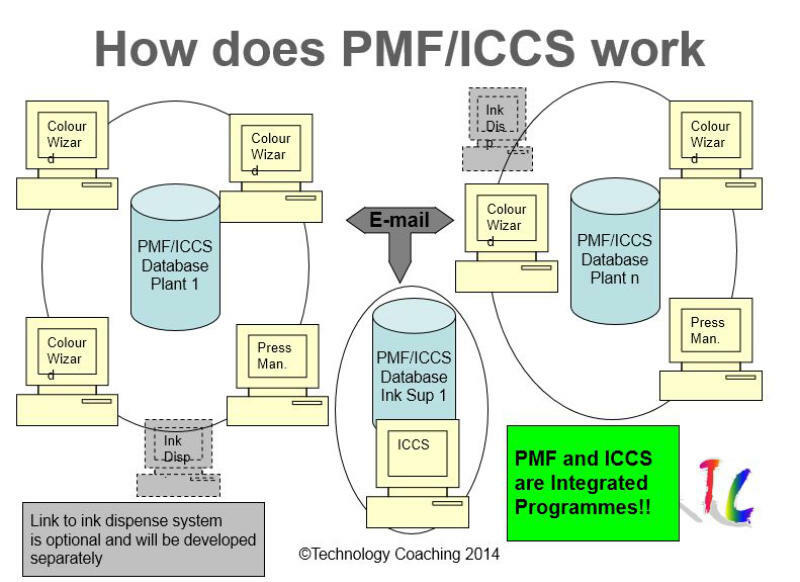 • Download Brochure • Download Presentation • Download PMF Software • Download ICCSforPMF Software (Ink formulation and colour database Software) Contact Technology Coaching if you want more information or a quotation.